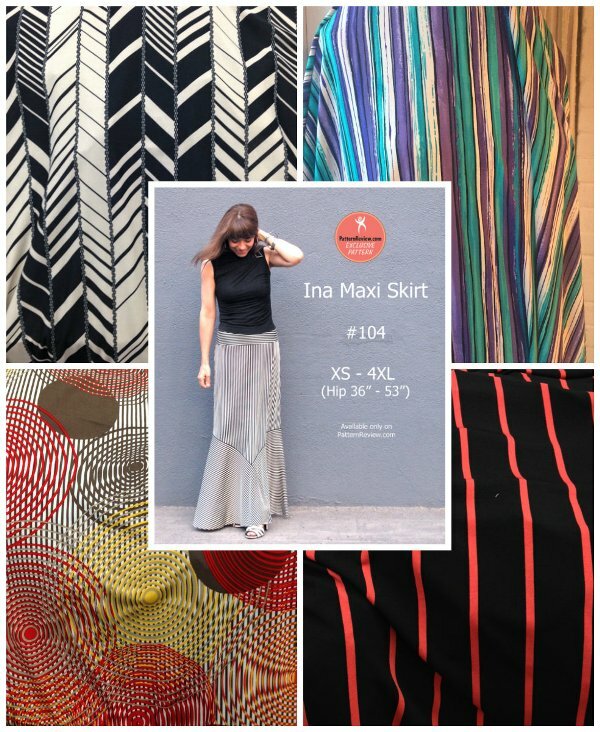 Spring is just around the corner and the perfect addition to your spring wardrobe is a maxi skirt. There are a lot of different maxi dress and skirt patterns out there and PatternReview.com has added a unique and fun skirt pattern to the list. 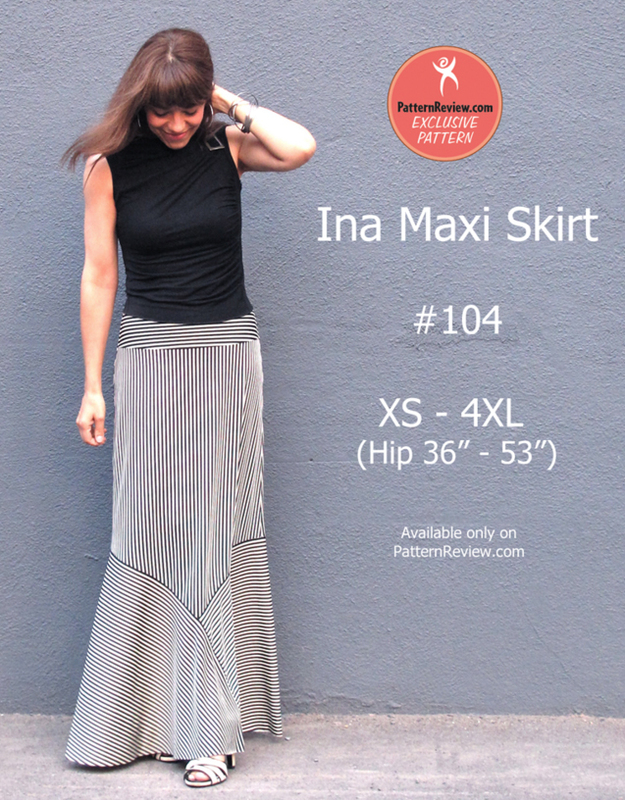 The Ina Maxi Skirt has a slight A-line design with two bias godets for a flattering silhouette. This pattern is easy to sew and flattering for all body types. It may even take you less than 2 hours from cutting to finishing! This pattern comes in size XS-4XL and looks great on various body types. There are over 30 reviews of this pattern that can be found HERE. 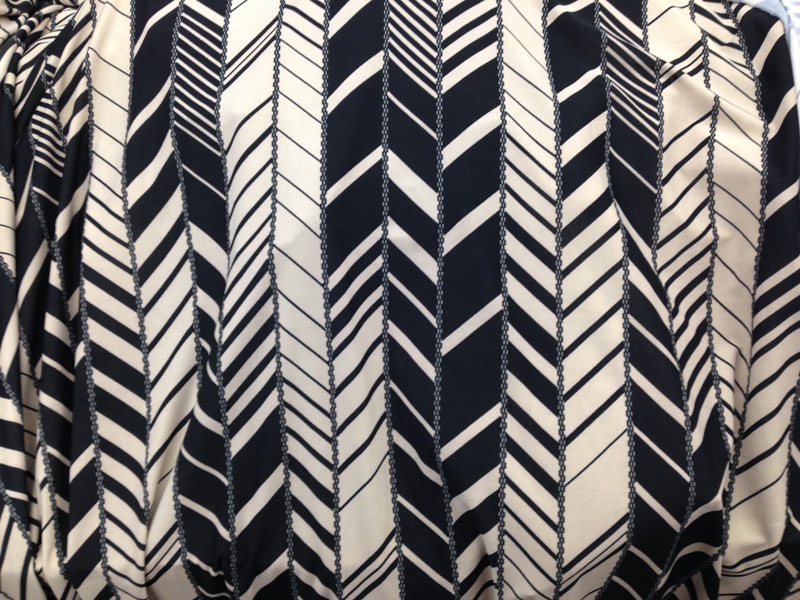 This pattern especially looks great with a vertical stripe knit, which we have supplied for Pattern Review. You can't imagine how hard it is to find vertical stripe knits and finding a good one to boot! I searched for months trying to find the perfect vertical stripe and we found four great prints. They are available in limited quantities only through Pattern Review! They come in a 2 yard cut (yes that is enough for the skirt in ALL sizes!) Deepika has a cutting layout on her blog. Navy/Coral Vertical Stripe ITY Knit - $17.98 for non-PR members ($16.18 for Friends of PR members) This stripe knit has a great nautical look to it with the combination of navy and coral. 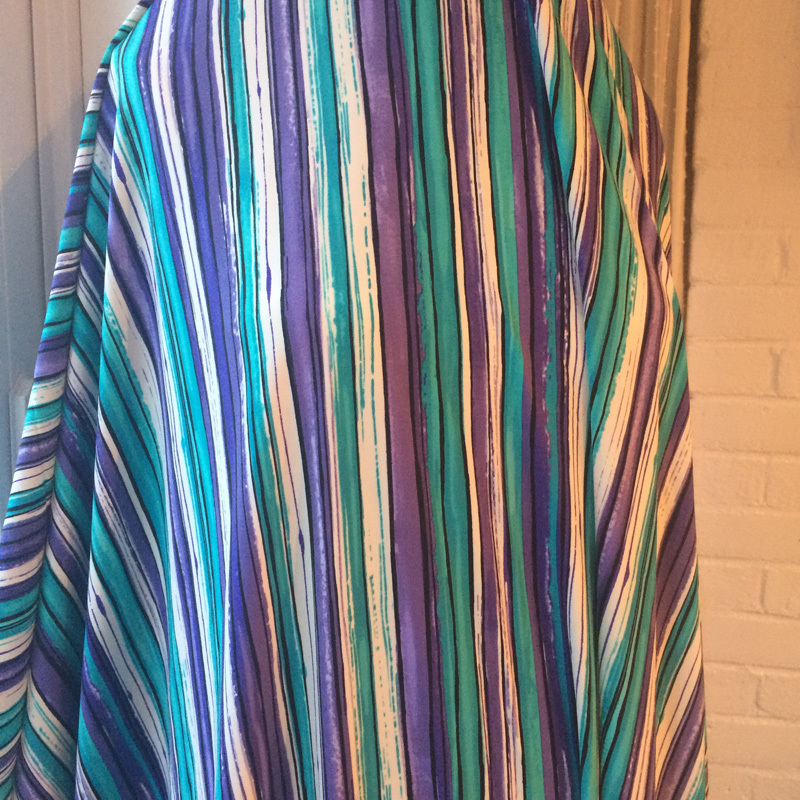 The simple stripes cascade gracefully to the center and the vertical stripe makes you look long and lean! 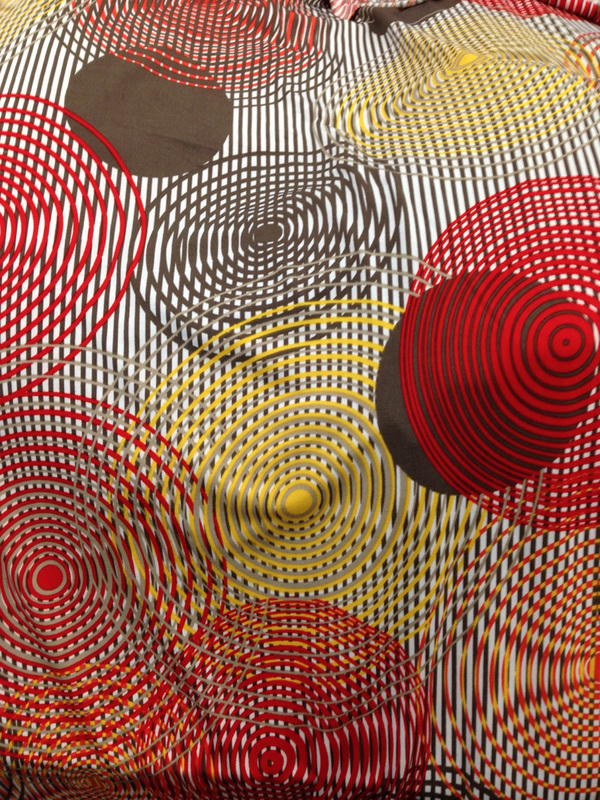 Multi-Stripe Circle ITY Knit - $17.98 for non-PR members ($16.18 for Friends of PR members) This is not just a stripe knit, but it also has crazy circles that play with your eyes! Great color combination and could be paired with a lot of different solid shirt options. Teal/Purple/Black Vertical Stripe Knit (Nylon/Lycra) - $23.98 for non-PR members ($21.58 for Friends of PR members) This vertical stripe knit is a little different from the rest of the knits because it is made from nylon/lycra. This knit is beefier than an ITY knit. Drapes nicely and comes with such pretty coloring. Head on over to Pattern Review to get your Ina Maxi Skirt and coordinating fabric. And if you're not into stripes, there are many knits to choose from on our website. Have you made the Ina Maxi Skirt? 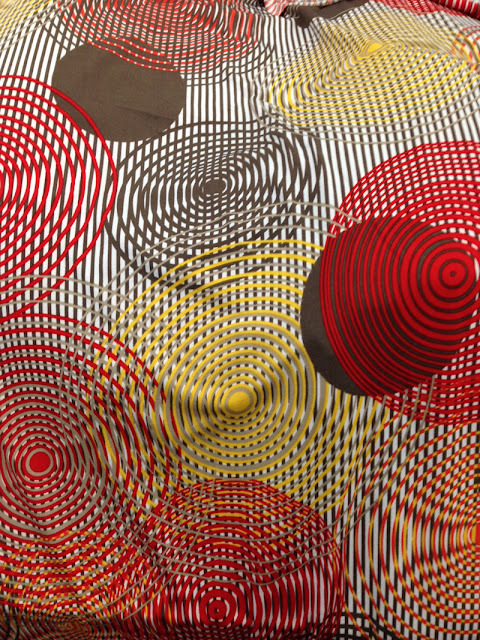 Share your finished garment with us by emailing photos to: fabricmartblog@gmail.com.